I suppose after months of the weekly creature feature, it is finally time to talk about chickens. 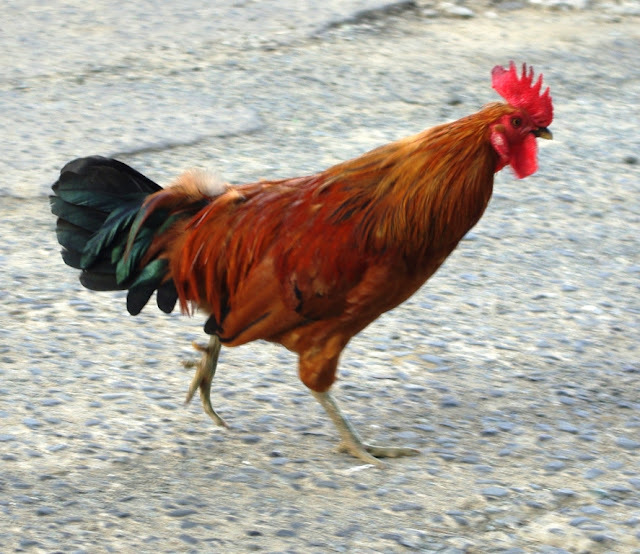 I've been putting off the chicken conversation for a while because, quite frankly, I don't like how they wander freely all over the island. Tourists seem to love them, as I suppose they lend a rather more Caribbean character to Tortola. My general fear of birds, along with my belief that birds are very dirty, probably contributes to my dislike of the local chickens. My dislike is increased by the chickens' choice of dumpsters as favored hangouts. While they understandably enjoy snacking on whatever sweet morsels may be found in the trash, I always have a small heart attack when I throw some trash into the dumpster, and a startled chicken comes rocketing out, screeching, wings a-flapping. At least the food trucks selling fried chicken help keep the chicken population in check.